The day after my last post, I did take a run at the applique on my new project L'Herbier, and I was quite pleased with the result, but I didn't take any photos of the process. Yesterday I did a second one, and I think I got carried away with the photos! But, I have never seen this exact combination of techniques anywhere else, so I might as well show all the details. Be warned, this will be a long post! Some of the embroidery that will go in the circles is quite heavy, with beads, etc. So, a backing is required. I decided on a muslin backing because a) I prefer not to use a fusible stabilizer in a piece that I want to last a long time, and b) with my chemical sensitivities I need to wash everything before I work with it, so nothing with a lot of starch or sizing would work. The kit came with just the bare minimum of fabrics for the circles, and then I had to wash it as well. So I really couldn't do the embroidery without sewing it into the blocks first, because the pieces would be too small to hoop, and finishing the edges to prevent fraying would leave them even smaller. 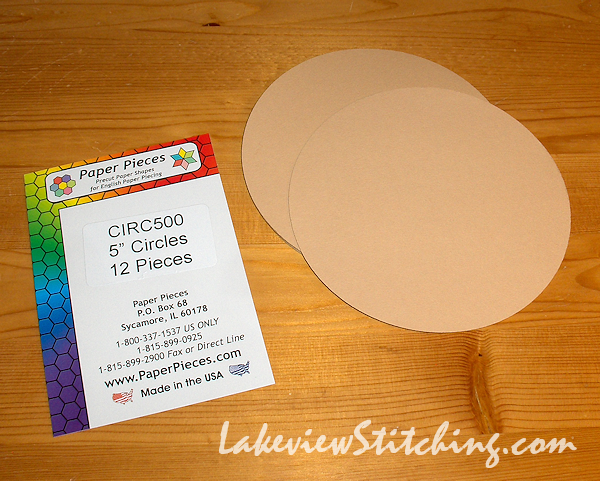 These light card 5" circles from Paper Pieces, one of my favourite stores, are what made this whole idea come together. Although the circles in the pattern are about 5.5", I reduced them slightly to 5" so that I would have a comfortable seam allowance to work with. To help centre the circle on the four patch blocks, I started by carefully pinching the four compass points on the circle. 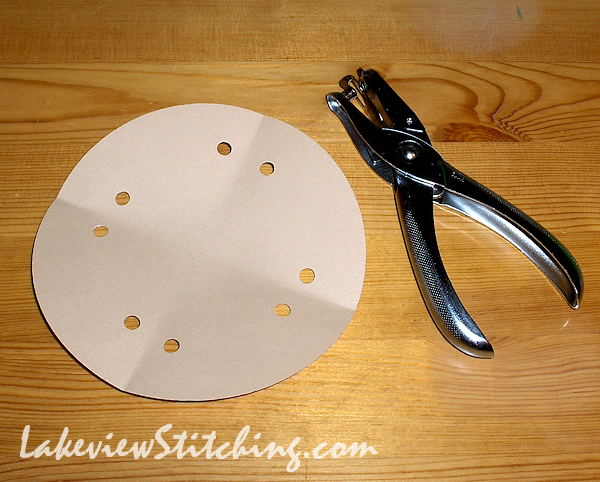 Then I used a hole punch to make holes for the pins to go through later. 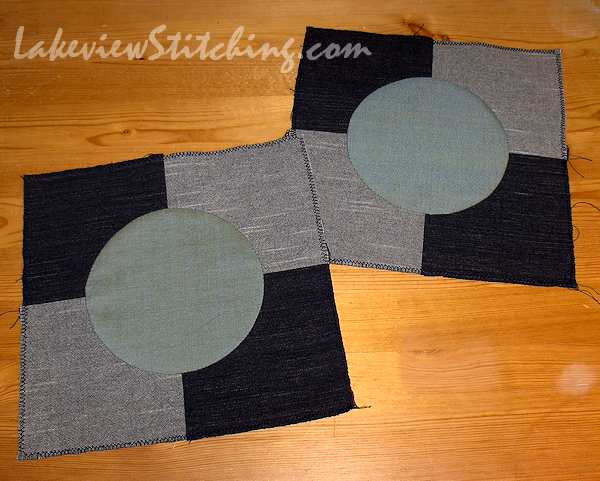 For the fabric, I cut 6" squares of both the top fabric and the muslin lining. The top fabric and the muslin are layered together, and the prepared circle is lined up so the folds follow the grain line. Lining up the grains is not strictly necessary, but it seems to follow naturally from the process, so I thought I may as well do it. 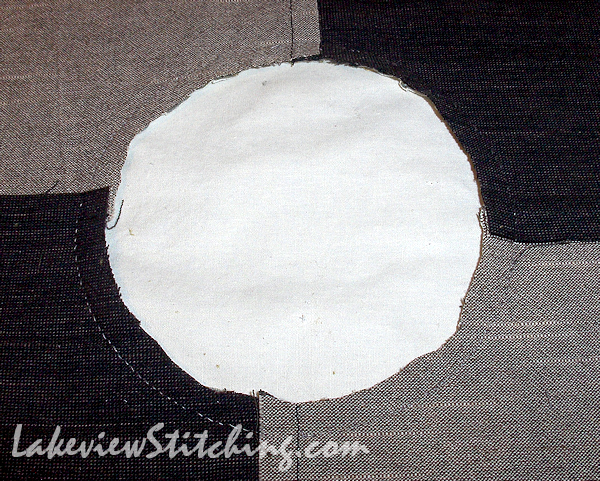 To start the basting, I took at tack stitch at one of the folds in the paper, and then ran a loose running stitch through both layers of fabric, but not through the paper, about 3/16" outside the edge of the circle. I made a second tack through the paper at the next fold, and pulled the running stitch tight to gather it around the paper. Here's a close up of the basting. On my first circle I used some old polyester thread for the basting, but I found that it was too stretchy to hold the two layers of fabric firmly. This time I went with the same strong cotton quilting thread I used for my yoyos (embarrassingly long ago). 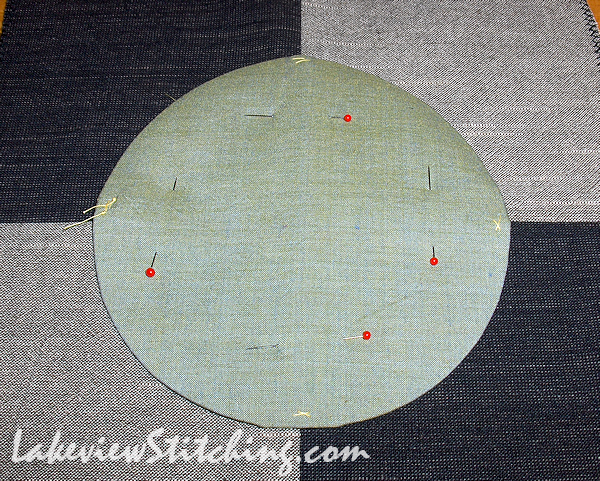 Here you can see that the only threads visible on the front of the circle are the tack stitches at each fold. I continued with the running stitch and tacks at each fold all the way around. Now the basting is finished. 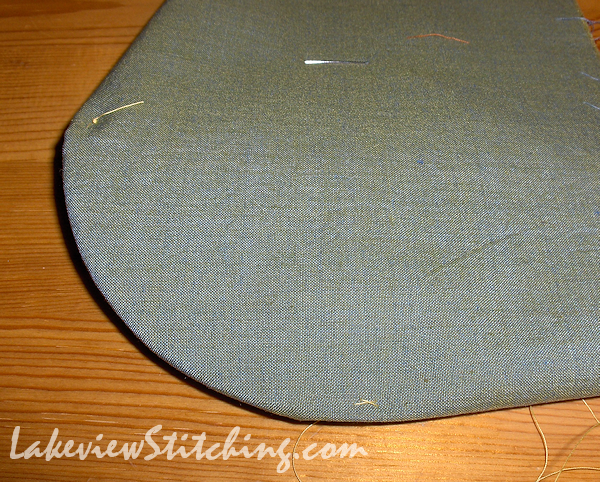 I leave the wide seam allowances in place until after I take the circle to the ironing board and steam press a crisp edge all the way around. That way I don't burn my fingers! 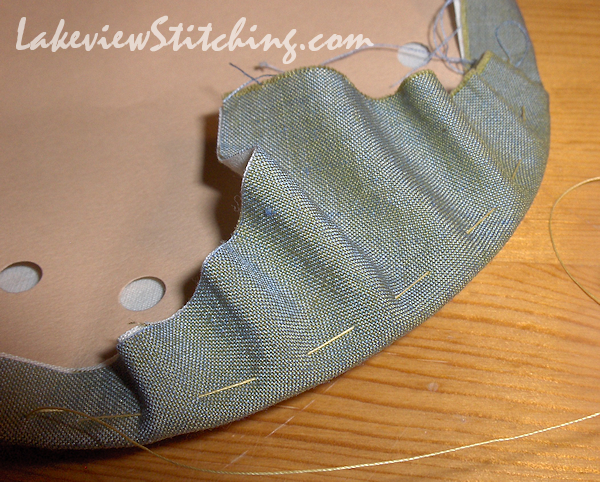 After ironing I trim the seam allowance down to about 3/8". After the applique is finished I will trim it again to about 3/16". 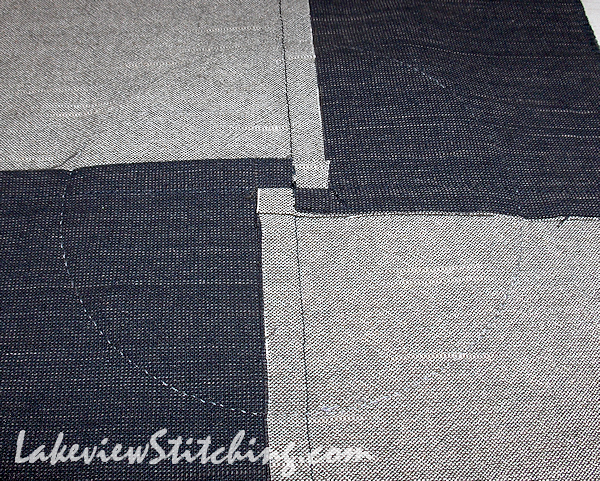 Then I repinch the fold lines at the compass points to help position the circle on the block. 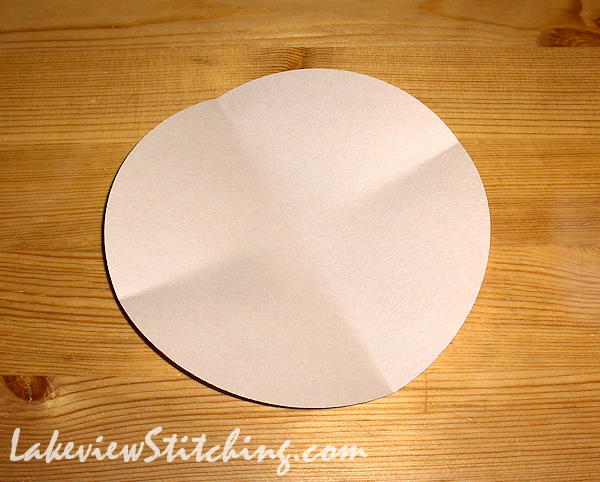 Even though the paper has been ironed, it "remembers" the original folds. The folds at the compass points are lined up with the seams in the block background. 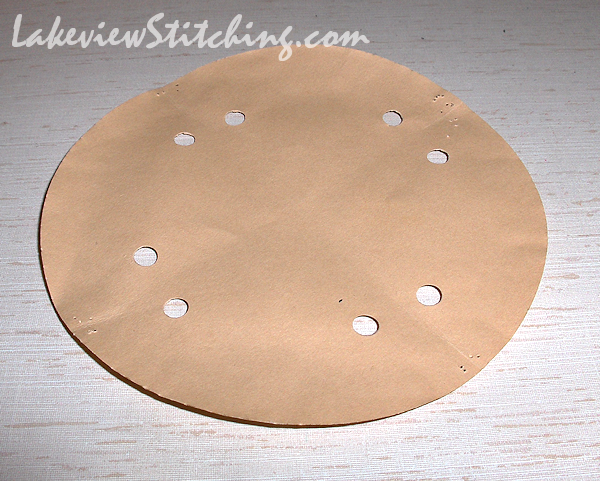 The circle is pinned down through the holes that were punched in the paper circle. You can feel them through the fabric, so you know where to put the pins. Now I was finally able to sew! 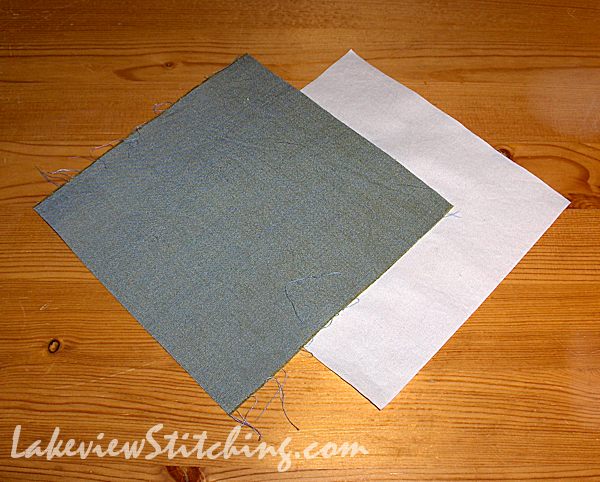 I was careful to catch both the top fabric and the muslin in the applique stitches. I admit it was heavy going! I used 50 wt cotton sewing thread and a Clover embroidery needle for the applique. I have been using an embroidery needle for all my heavier English Paper Piecing, such as the Best Friends Forever blocks. 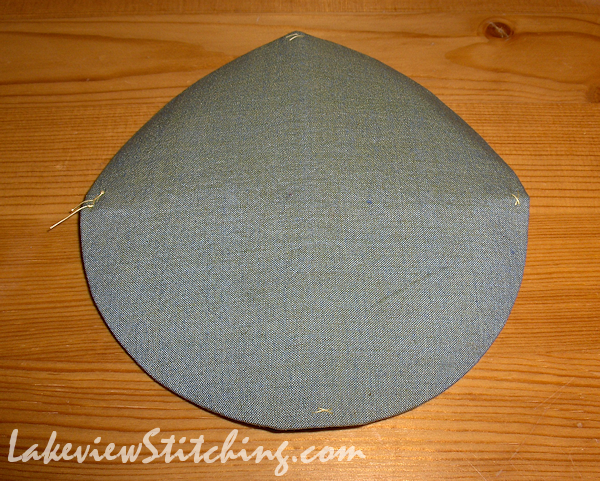 I find it is easier to thread, easier to hold, and sharp and strong enough to pierce several layers of fabric. 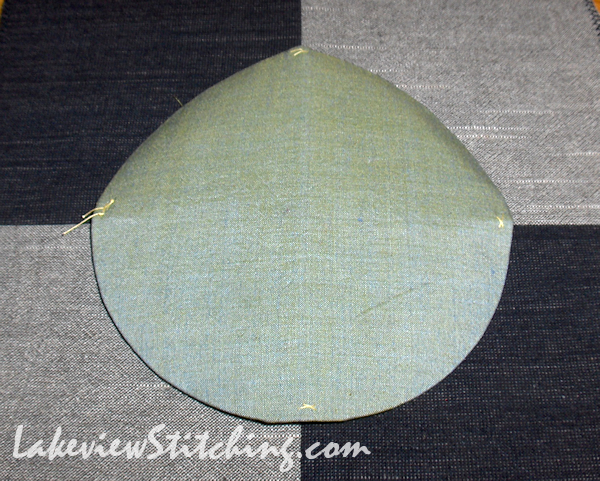 In this photo you can just see the line of applique stitches around the edge of the circle. 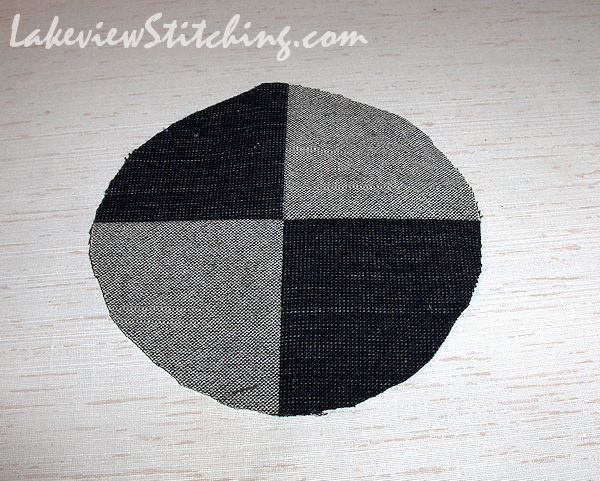 When the stitching is finished I trim away the backing fabric behind the circle. That's when it's particularly nice to have the cardboard in there, so you don't cut through the top fabric! 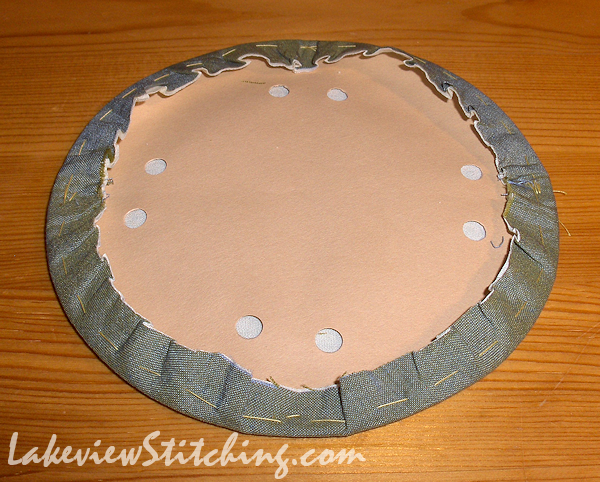 The backing is trimmed to about a 3/8" seam allowance. There was a lot of bulk in the seam allowance, so I graded it by trimming the muslin and top fabrics down to 3/16". It lies wonderfully flat! The final test will be to see how the block holds up for the embroidery. That's next! I want to make sure it's all good before I prepare any more blocks. Very interesting technique. I don't like fusibles either so I see your point in using the muslin. Looking good! Thanks, Rachael! I like the pillow idea quite a bit -- it is sturdy fabric. Wow. Great stepouts. I probably would have marked off generous squares on the uncut gray fabric, embroidered the designs using a hoop, then marked circles around the finished embroidery. But then I hate like the dickens to embroider through two layers, no matter how thin. Thanks, Mary Ellen! There was no room for generous anything, unfortunately. The focus fabrics were exactly 6" wide, before washing. The muslin proved to be less than ideal today, though, so I will have to substitute something else. But the applique held the two layers together very well, so that was a success. Tune in tomorrow to see the first embroidery! 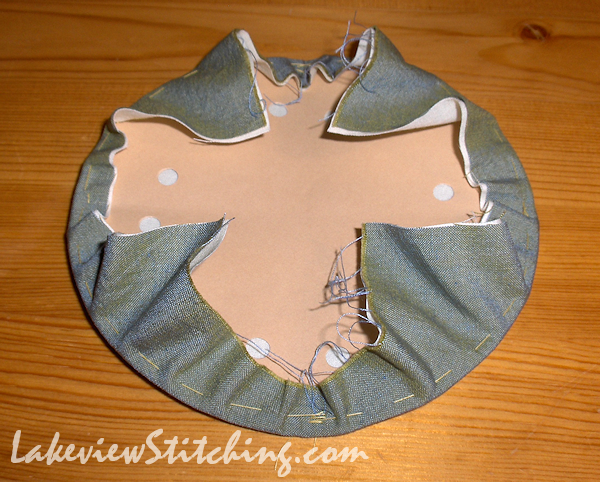 You can use the leftovers to embellish a casual jacket or skirt! 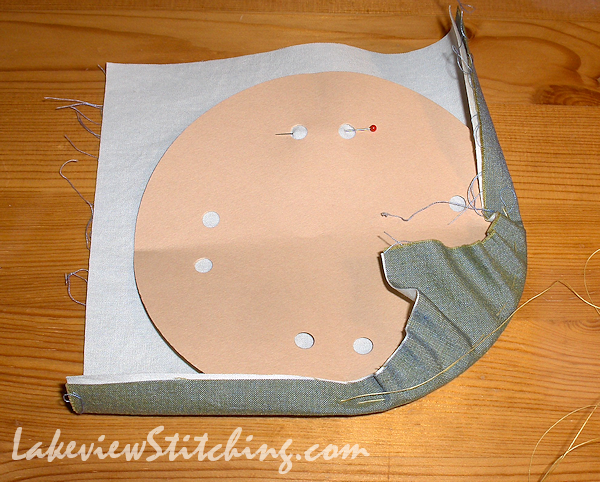 Fuse them on and use a fancy stitch on your sewing machine to outline them. Really great process and tutorial. Monica. It is so well thought out and executed.